Set of three 10 ounce bone china mugs by Roy Kirkham decorated with a variety of items from the past. 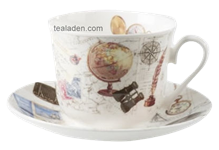 Each mug depicts a different a different set of vintage items such as a globe, watch, camera, telescope, etc. Dishwasher and microwave oven safe. Set of three bone china mugs.